What is next for women's soccer? 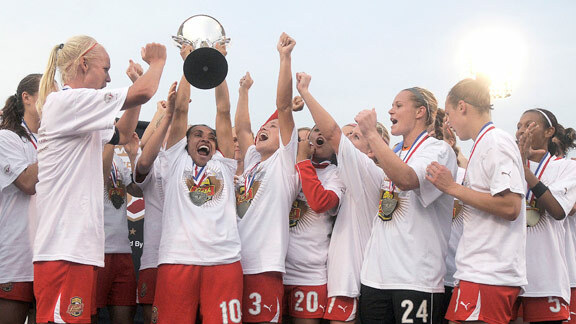 The Western New York Flash's won the WPS' final championship last season. When the WUSA collapsed in 2003, the women's soccer community rallied in an attempt to restart it, holding festivals in 2004 and trying to keep the league name alive. With Women's Professional Soccer's official demise Friday, the approach is dramatically different. No one is attempting to keep WPS going. Its clubs have moved on, and at least two leagues have launched or plan to launch professional divisions. The bottom line from all parties: Women's Professional Soccer is dead; long live professional women's soccer. "I don't believe soccer in the U.S. is done, thanks to the many leagues around the country that are still being held to high standards like the WPSL," Boston Breakers defender and former U.S. national team player Cat Whitehill said. "I believe we can keep top soccer in this country if everyone from the ownership to the players commits to it 100 percent. I understand there are amazing leagues across the world, but I believe the U.S. will find a way to create a professional environment as long as the commitment is there." Boston and fellow former WPS clubs Western New York and Chicago are playing in the WPSL Elite League this season. It has a mix of pro teams and high-level amateur teams. 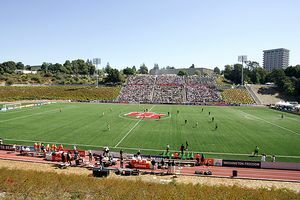 The WPS suffered from low attendance, among other issues. "Since August of 2010, the WNY Flash organization's intention and plan for the future has been consistent; that is to compete in the highest level league in the USA," Flash owner Joe Sahlen said. "In 2011 that league was WPS, in 2012 that league is WPSL Elite and 2013's obviously is yet to be determined. "For 2012, while all the pieces are yet to come together, we have a good game [Saturday] night in Sahlen's Stadium versus the New York Fury." The United Soccer Leagues' W-League has had pro teams in the past, and the league is revving up its effort for a pro division next season. "W-Pro is being developed to offer an economically viable and sustainable model for professional women's soccer in the United States and Canada," USL president Tim Holt said. "Distinguished by a business plan focused on team services, creative marketing, financial discipline and player development, W-Pro will establish an exciting, stable league platform for team owners, players, fans and sponsors. A formal announcement and additional details about W-Pro will occur in the coming months." The W-League and WPSL already have some big names playing. U.S. national team players can only play a handful of club games while preparing for the Summer Olympics in London, but several have signed on to play when they can. Some of the teams share names and resources with Major League Soccer teams. "I think that's very important, to have the men's brand and the men's foundation in place to build the women's program off of," said Joanna Lohman, a WPS veteran and D.C. United Women (W-League) player. "I played for Espanyol in Spain -- the men's club is very strong there. They already have a lot of following that can pick up and come to the women's game. It's a family atmosphere, and you have a much stronger connection with the men's club. And I think in terms of the big picture; it's better." The W-League and WPSL don't have a good relationship with each other, though the Breakers and D.C. United Women played an exhibition game last weekend. "They have their model, which is very interesting, but we have a model which we think works," WPSL commissioner Jerry Zanelli said. "The strongest thing we've got is we're an independent women's league with no affiliations with men's leagues. Our total focus can be on women, period." Said Whitehill: "I'm just glad we were able to cross leagues over. It shows potential." One person who is not showing any animosity at the moment is Dan Borislow, the magicJack owner who had a tumultuous tenure in WPS and wound up suing the league in an effort to keep his team from being terminated. Borislow was interested in fielding an exhibition team to face WPS teams this season and in 2013, but the deal fell apart. "The Borislow lawsuit was the coup de grace, but to say that was what sunk the league is disingenuous," former Breakers general manager Andy Crossley said. "The league was down to five teams on paper. Puma (sponsorship) was gone -- there was no one to supply the teams with the necessary gear. The league office and a couple of the teams were ghost ships by October. There was no meaningful activity happening." While several WPS teams may live on, others have gone dormant. Atlanta Beat owner T. Fitz Johnson said Friday he has no plans to continue with his team, which joined WPS in 2010 and worked with Kennesaw State University to build a soccer stadium. Atlanta already has a long-standing W-League team, the Atlanta Silverbacks. Owners for Sky Blue (New Jersey) and the Philadelphia Independence could not be reached for comment Friday. While the W-League and WPSL plan to have professional players, neither league anticipates a big budget. WPS had scaled back on player salaries and operating budget, which was already scaled back from what the WUSA budget had been. "Outside of the big four leagues [MLB, NBA, NFL, NHL] and MLS, name a stable sports league in his country that pays its players middle-class wages and full benefits without subsidies from a parent organization?" said Crossley, who tracks defunct sports teams at FunWhileItLasted.net. "You can't do it. Maybe [the] WNBA, but there is still a considerable amount of NBA infrastructure at work there. Arena Football came close a few years back, paying some players over $100K per year, but they went bankrupt doing it. And that was with an NBC television contract and average attendance league-wide over 12,000 per game. "It's not gender politics," Crossley said. "It's the economics of an incredibly tough industry." The Chicago Red Stars got a head start on other former WPS teams, jumping to the lower-budget WPSL in 2010 and moving up to the WPSL's new elite league in 2011. Red Stars owner Arnim Whisler, whose team has signed WPS vets such as Lori Chalupny, is bullish on the future. "As long as the teams, players and fans continue the fight, a top women's soccer league will ultimately succeed. We will all miss WPS, but the phoenix is already rising again from the ashes." Beau Dure is a writer based in Northern Virginia who worked 10 years for USA Today and has written about soccer for ESPN.com, FoxSoccer.com and Knight Ridder Tribune News Service. He specializes in soccer, Olympic sports and mixed martial arts.